With Mothers' Day coming up in a few days, I thought it a good time to share this book, written by a Mormon mother who has seen her share of struggles. 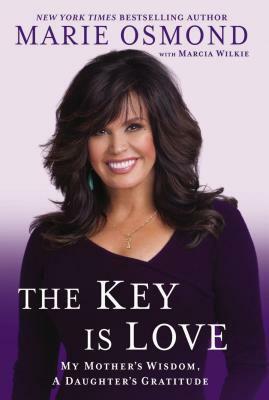 Marie Osmond’s life may seem glamorous from the outside, but she is just as human as the rest of us. She may have rubbed elbows with celebrities from Oprah to Elvis, but she has also dedicated her life to raising eight children, some to whom she gave birth and some she adopted. In The Key Is Love, Sr. Osmond shares with us some of the hard-won lessons she’s learned over her years as a mother, as well as the wisdom her mother passed on to her. Sr. Osmond told about when her daughter Jessica came out to her as a lesbian and her decision to “[stand] by her as a mom who loves her unconditionally.” She goes on to say “As a Christian, my understanding of God is that we are each created as one of His own children…I love my daughter with the same fierce love that I have for my other children. I know this is how Heavenly Father loves us, no matter what circumstances we create for ourselves or have even been put into without choice.” I hope that other parents of gay children will follow her example and continue to love their children unconditionally. I commiserated with her as she explained that “when you are a first-time mom, I think you want to believe that there is a ‘right’ way and a ‘wrong’ way to take care of a child’s needs, until you gradually begin to understand how unpredictable being a parent can be.” I remember that time! While I was pregnant with my first, I read every parenting book I could find, determined to get the “right” way to parent all figured out before he was born. Three children and more than a decade later, I’m much more humble and willing to admit how very little I truly have figured out.